This beautiful and striking example of Georgian silver was made in 1807 by one of the most important silversmiths of all time, Paul Storr, and bears a London hallmark. 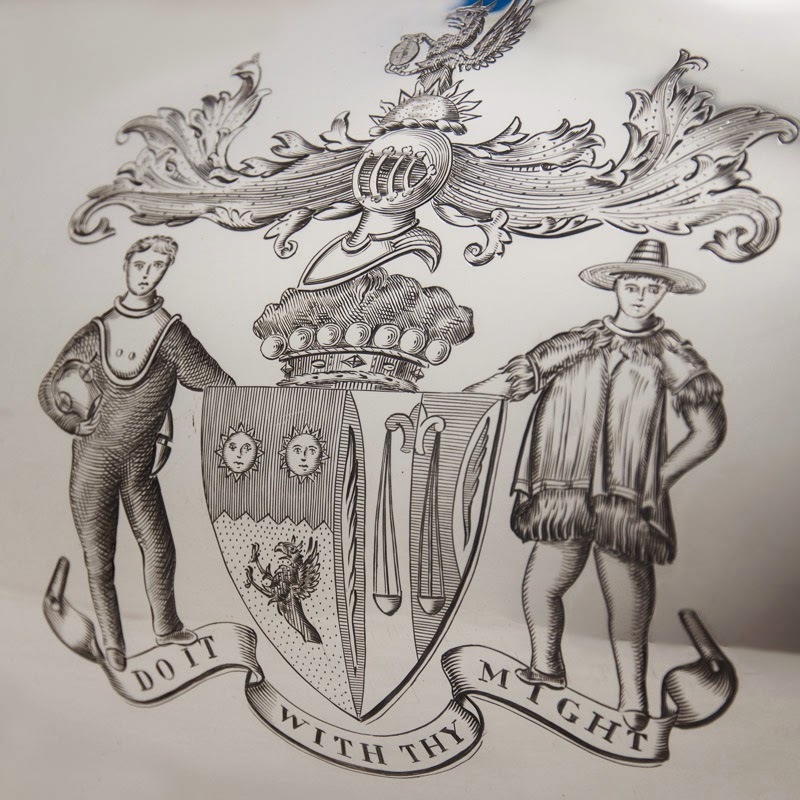 From the chosen words in the coat of arms I was able to do some research and found this to be an interesting and influential family. A Georgian salver also made by the revered Paul Storr. Click here to view on our website. Owing to the hallmark date I am to surmise that this serving dish cover may have been a gift to Sir Thomas Fowell Buxton and his bride to mark their wedding. Of course this is just supposition, but it does fit into place nicely. So now a little look into who this man was. Image from Heroes of the Slave Trade Abolition, by unknown artist, given to the National Portrait Gallery, London in 1936. Courtesy Wikimedia Commons. Sir Thomas Fowell Buxton, 1st Baronet, 1786 - 1845 was MP for Weymouth and Melcombe Regis. Whilst serving as MP he led the campaign to abolish slavery as an economic system. Buxton was a Christian social reformer with an interest in education for the poor and prison reform. The slave trade was abolished in 1807 but Buxton continued with his work in order to abolish the institution of slavery. He took over the Anti Slavery Society in 1823 and his goal was achieved in 1833 when slavery was officially abolished in the British Empire (with the exception of India). In May of 1807 he married Hannah Gurney, sister of the prominent Quaker, Joseph John Gurney and the social reformer Elizabeth Fry. The couple went on to have 8 children, five of which died in childhood. Through connections with his mother Anna Hanbury’s family he was appointed work at the brewery Truman, Hanbury & Co. in London’s Hoxton. When he made partner in 1811 the name was changed to Truman, Hanbury, Buxton & Co. and he eventually became sole owner. In 1818 he was elected MP for Weymouth and Melcombe Regis. He retired from politics after losing his seat in 1837. In 1840 he was made Baronet of Bellfield in Dorset and Runton in Norfolk. He died at home in Northrepps Hall, in Norfolk, in 1845 at the age of 59. You can find an image of Thomas Fowell Buxton on the back of a current five pound note. He is the tall spectacled man to the left attending a visit to Newgate Prison. You will also find a statue of him in Westminster Abbey, as well as a memorial fountain in the gardens adjoining the Houses of Parliament. So there we have it. 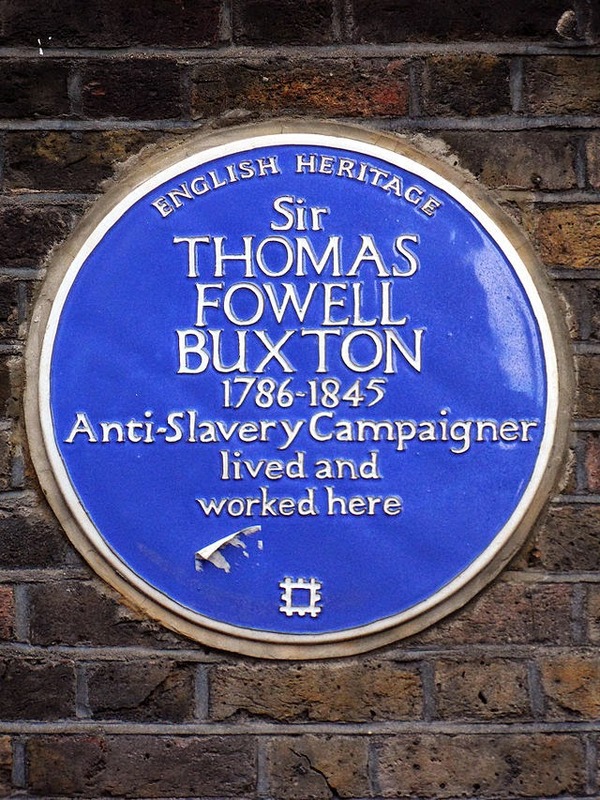 Thomas Fowell Buxton; MP, abolitionist, social reformer and brewer too. 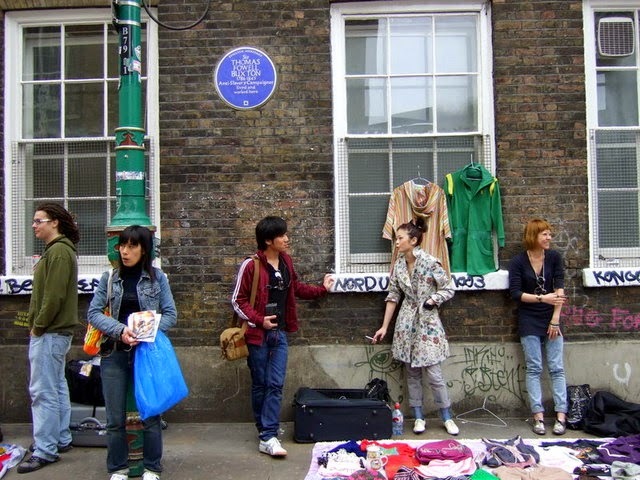 A blue plaque marks Buxton's former residence on Brick Lane, London. Image via. The plaque in situ on London's bustling Brick Lane, site of the Truman brewery. Image via. As a final note, this seems a fitting time to reflect on the hard work of Thomas Fowell Buxton, as February sees Black History Month being observed in North America. If you wish to find out more about his legacy, there is a charitable foundation in his honour, The Thomas Fowell Buxton Society. Please check out their website (www.thomasfowellbuxton.org.uk) for more information.